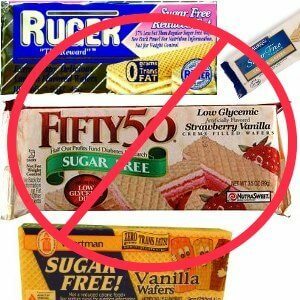 This is a story about my search to find the healthiest sugar free vanilla wafers that exist. And the search is…well…a tough one! I spent a while going through all the different sugar free products available on the net, sorry to say but there wasn’t much to find. I started with Murray’sBrand. The thing is, this brand was sweetened with Aspartame, which is not good for you at all. My 3rd choice that I found was Fifty-50 Sugar Free Wafers. So what were they sweetened with? Good old Diarrhea-inducing Sorbitol. Yuck! If you ate even just a few of these cookies you would find yourself rushing to the bathroom fairly quickly because Sorbitol CANNOT be absorbed by your body. And the 4th and final sugar free product I found was Voortman Sugar free wafers, and once again we get stung by the slap of Sorbitol! I’m sorry to say, but this search really isn’t going well, and I can’t seem to find any more products that are even sugar free (nonetheless healthy). So I have finally come to the conclusion that if you want to eat sugar free wafers, you are going to have to make them yourself!